Yesterday we covered the first ever nationwide test of the FEMA IPAWS integration into the Emergency Alert System; while there were a few random glitches, at first it looked like everything went well. But last night, in Utica, New York, Television viewers started seeing weird messages pop up on their screen warning of a pending Hazardous Materials disaster somewhere in the United States. The odd warning was sent over WKTV News Channel 2 in Utica, New York. 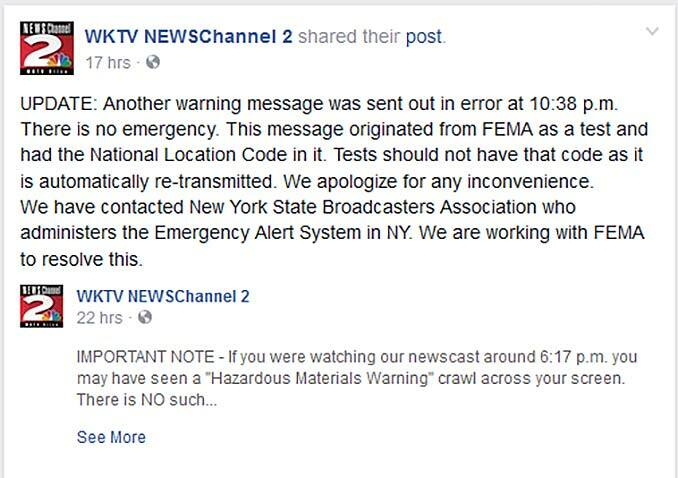 The station quickly sent out a message on their Facebook page saying there was no emergency and blamed the message on FEMA test codes that were not intended for public broadcast. But hours later, concerned viewers reported seeing the message pop up on their screens again. Another warning message was sent out in error at 10:38 p.m. There is no emergency. This message originated from FEMA as a test and had the National Location Code in it. Tests should not have that code as it is automatically re-transmitted. We apologize for any inconvenience. We have contacted New York State Broadcasters Association who administers the Emergency Alert System in NY. We are working with FEMA to resolve this. FEMA replied that they did not send this out. They will launch a full investigation into how their codes were hacked. WKTV seems to be the only target of this hack. For now, we have disabled the codes in our decoder that trigger this alert. If there is a real National Alert, we will still receive it from the local radio stations we are assigned to monitor. WKTV will cooperate fully with FEMA, providing information about our hardware, software and internet access, and will provide log files from our devices. This information will be helpful to FEMA to track down the source of this hack. Six years into the failed EAS experiment and these people still can’t figure out how to make this system work properly? The problem with the original EAS system (as well as the EBS system that came before it) is that it completely depended upon alerts being relayed through a number of stations before it gets to the one in your area you happen to be tuned to. The first national test in November 2011 demonstrated how unreliable that model can be, and a stunning number of stations either never aired the test or aired it so badly that it could not be understood. This week tested the system that has been fortified to add internet delivery of alerts, and it made an enormous difference. My facility, which controls 21 digital television channels in five cities, had 100% success, with every one airing the message within seconds of origination, with excellent audio quality. When there’s an emergency, this is exactly the level of performance you need to have… and the existing relay system is still in place for redundancy. To address Tinker’s points: first, the Emergency Alert System and its predecessors have always been controlled at the federal level; nothing has changed, except that now it works better. Second, consider that the National Weather Service, which originates the vast majority of EAS alerts, is a federal agency… so yes, clearly there is a need for federal agencies to use the system efficiently. And as for speed… this test demonstrated that EAS can indeed be very fast, probably faster than Twitter. As far as the WKTV incident is concerned, that’s a totally separate issue from the national periodic test that ran Wednesday afternoon. If history is any indication, this could be similar to incidents several years ago when other stations aired zombie apocalypse warnings; they installed equipment without changing the default passwords. IF your station handles that much, why not integrate the EAS into the TV providers, rather then the channels? go through the Cable and Satellite providers for direct overlay of broadcast channels, eliminating channel data until EAS is done, this will address a majority a lot easier and faster IMO, asi it bypasses the individual channel attempt, and goes directly to the broadcasting provider source. the over air people like me who never watch over the air television anyway since the advent of Netflix wouldn’t get the message anyway, but we’d probably get the story in a short time from internet. Why did the video link get taken down??!! Is no one else concerned with the line “Would you. Could you. On a Train? Wait for further instructions.”? Given the fact shortly after the train derailed in New Jersey.